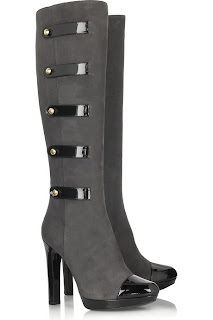 As summer seems to have given up on us, it's time to start looking forward to all those yummy winter boots. Let's face it, winter boots and shoes are sexier than summer sandals. Like these Fendi ones. Military styling is always a popular A/W trend but the muted grey suede and black patent toe cap also hint at a touch of Victoriana, which is again also popular. At £694.99, they're definitely an investment buy but I'll be looking out for the inevitable high street alternatives to share with you! The name of your blog is so true. Shoes are little pleasures women just have to have.